"Red Lady" redirects here. For the fictional priestess known as the "Red woman", see Melisandre. Left: the remains as seen from the feet. Right: the remains as seen from the head. 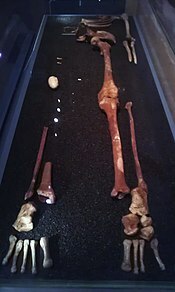 The Red Lady of Paviland is an Upper Paleolithic partial skeleton of a male dyed in red ochre and buried in Britain 33,000 BP. The bones were discovered in 1823 by William Buckland in an archaeological dig at Goat's Hole Cave (Paviland cave) — one of the limestone caves between Port Eynon and Rhossili on the Gower Peninsula, south Wales. The remains were at first thought to be a Roman Britain era female, however more recent analysis indicates the bones of a young male. Goat's Hole was occupied throughout prehistory. Artefacts are predominantly Aurignacian, but also include examples from the earlier Mousterian, and later Gravettian and Creswellian periods. The site is the oldest known ceremonial burial in Western Europe. When the creationist Buckland discovered the skeleton in 1823, his treatise misjudged both its age and gender. Buckland believed that human remains could not be older than the Biblical Great Flood, and thus wildly underestimated its true age, believing the remains to date to the Roman era. Buckland believed the skeleton was female largely because it was discovered with decorative items, including perforated seashell necklaces and jewellery thought to be of elephant ivory but now known to be carved from the tusk of a mammoth. These decorative items, combined with the skeleton's red dye, caused Buckland to mistakenly speculate that the remains belonged to a Roman prostitute or witch. By the time a second archaeological excavation was undertaken to Paviland Cave in 1912, it was recognized through comparison with other discoveries that had been made in Europe, that the remains were from the Palaeolithic; although before carbon dating was invented in the 1950s, there was no existing scientific method for the determination of the age of any prehistoric remains. Early carbon dating has historically tended to give results which were underestimations of the age of samples, as radio carbon dating techniques have developed and become more accurate, the age of the Red Lady of Paviland has gradually been pushed back. In the 1960s Kenneth Oakley published a radiocarbon determination of 18,460 ± 340 BP. Results published in 1989 and 1995 suggest that the individual from the cave lived at about 26,000 years ago (26,350 ± 550 BP, OxA-1815), during the later periods of the Upper Paleolithic. A 2007 examination by Thomas Higham of Oxford University and Roger Jacobi of the British Museum suggested a dating of 29,000 years ago. A recalibration of the results in 2009 suggest an age of 33,000 years. Although now on the coast, at the time of the burial the cave would have been located approximately 70 miles inland, overlooking a plain. When the remains were dated to some 26,000 years ago, it was thought the "Red Lady" lived at a time when an ice sheet of the most recent glacial period, in the British Isles called the Devensian Glaciation, would have been advancing towards the site, and that consequently the weather would have been more like that of present-day Siberia, with maximum temperatures of perhaps 10°C in summer, −20° in winter, and a tundra vegetation. The new dating however indicates he lived during a warmer period. Bone protein analysis indicates that he lived on a diet of between 15% and 20% fish, which, together with the distance from the sea, suggests that the people may have been semi-nomadic, or that the tribe transported the body from a coastal region for burial. When the skeleton was discovered, Wales lacked a museum to house it, so it was moved to Oxford University, where Buckland was a professor. In December 2007 it was loaned for a year to the National Museum Cardiff. Subsequent excavations yielded more than 4,000 flints, teeth and bones, needles and bracelets, which are on exhibit at Swansea Museum and the National Museum in Cardiff. Analysis of the evidence from the two excavations at Long Hole Cave on the Gower Peninsula, including sediment and pollen as well as the lithic evidence, has identified Long Hole as an Aurignacian site contemporary with and related to the site at Paviland, evidence of the first modern humans in Britain. ^ Richards, M. P.; Trinkaus, E. (September 2009). "Out of Africa: modern human origins special feature: isotopic evidence for the diets of European Neanderthals and early modern humans". Proc. Natl. Acad. Sci. U.S.A. 106 (38): 16034–9. Bibcode:2009PNAS..10616034R. doi:10.1073/pnas.0903821106. PMC 2752538. PMID 19706482. ^ "Ancient skeleton was 'even older'". BBC News website. BBC. 30 October 2007. Retrieved 29 December 2010. ^ a b Aldhouse-Green, Stephen (2001). Denison, Simon (ed.). "Great Sites: Paviland Cave". British Archaeology (61). ISSN 1357-4442. Archived from the original on 23 September 2015. Retrieved 3 August 2016. ^ Callaway, Ewen (2 May 2012). "Archaeology: Date with history". Nature. 485 (7396): 27–29. Bibcode:2012Natur.485...27C. doi:10.1038/485027a. PMID 22552075. ^ Dinnis, R (2012). "Identification Of Longhole (Gower) As An Aurignacian Site". Lithics: The Journal of the Lithic Studies Society. 33: 17–29. Retrieved 3 August 2016. Sommer, Marianne. Bones and Ochre: The Curious Afterlife of the Red Lady of Paviland. Harvard UP, February 2008. 416pp. British Archaeology magazine, Oct. 2001, "Great Sites: Paviland Cave"